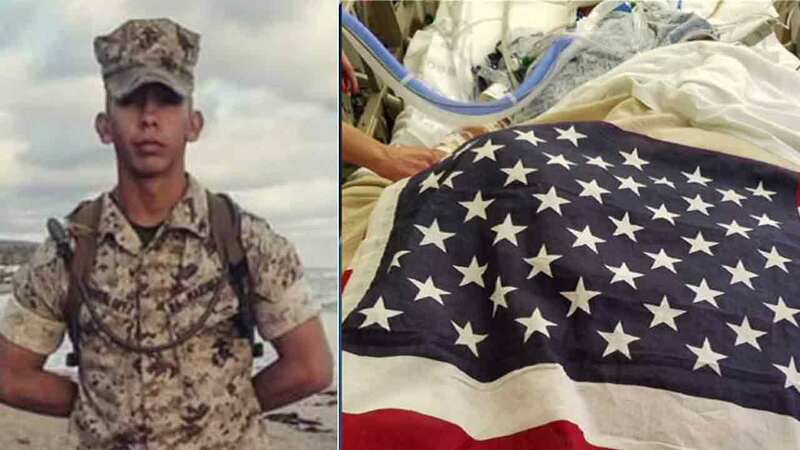 SOUTH LOS ANGELES -- A young U.S. Marine has been declared brain dead Sunday after getting shot in the back of the head in South Los Angeles, L.A. police officials said. According to LAPD Media Relations officials, Carlos Segovia was shot once in the head near 31st Street and Western Avenue at about 11:30 p.m. Friday. Police said a vehicle pulled up beside his, and a suspect or suspects opened fire. Segovia was not in uniform when he was shot, according to authorities. The family of Segovia contacted ABC News and said the 19-year-old was home on military leave. For several years, Segovia volunteered for a group that feeds the homeless, and six months ago, he became a U.S. Marine to serve his country, his family said. "All I know is someone did this to him. They didn't think about anything - who he was, who he is. It just hurts us, you know?" said Claudia Perez of L.A. on Cloud 9, the organization where Segovia volunteered. Segovia's family was asking for two things: prayers and for anyone with information on the crime to come forward to police. The LAPD said the shooting was not gang related, and they did not have information on any suspects or their vehicle.